A few weeks ago, I was looking for some cute dishtowels to give to my friend, Andrea, as part of her birthday gift. I didn't really see any that I loved, so I thought I'd just make some myself! I thought they turned out so cute, I almost wanted to keep them for myself! I started by cutting a dinner napkin to about 6" wide, and I made the length just a little longer than the dishtowel. The hemmed edges in the picture below were existing, but I ended up cutting them off before going any further. I folded and pinned the edges of the napkin down while it was laying on top of the dishtowel, so that I could get the length to line up exactly with the hem of the dishtowel. Once I had all the edges pinned, I ironed them, then flipped the napkin right side up, and pinned it to the dishtowel. Then, just sew the napkin fabric onto the dishtowel. For the pleated ribbon, cut your ribbon to double the length of your napkin fabric. Then, simply fold it into pleats, pinning every other one, to hold the pleats together. 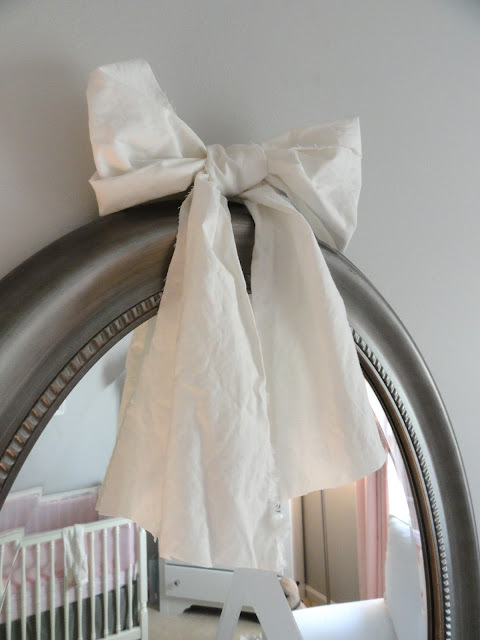 Place the pleated ribbon in the center of the napkin fabric, and stitch right overtop of the pleats. I didn't even bother to pin the ribbon to the fabric, but it worked out perfectly fine! Just try to keep it centered as you go! Yes....I know, my pins were in the wrong way! 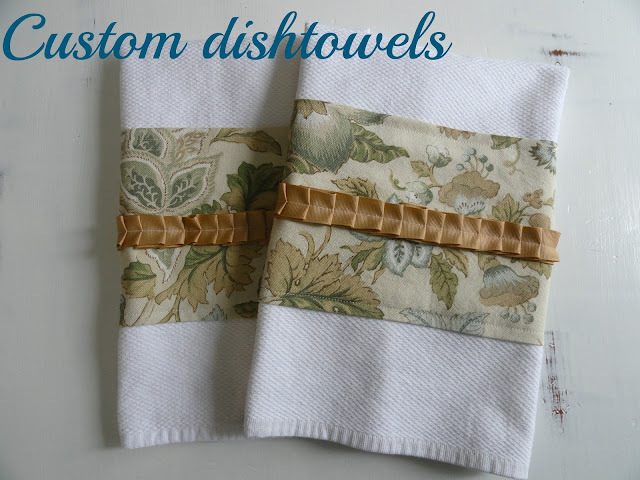 I only used one dinner napkin to make both of the dishtowels, so I gave the rest of the set to Andrea so she would have dishtowels and dinner napkins to match! There are so many possibilities with these dishtowels! 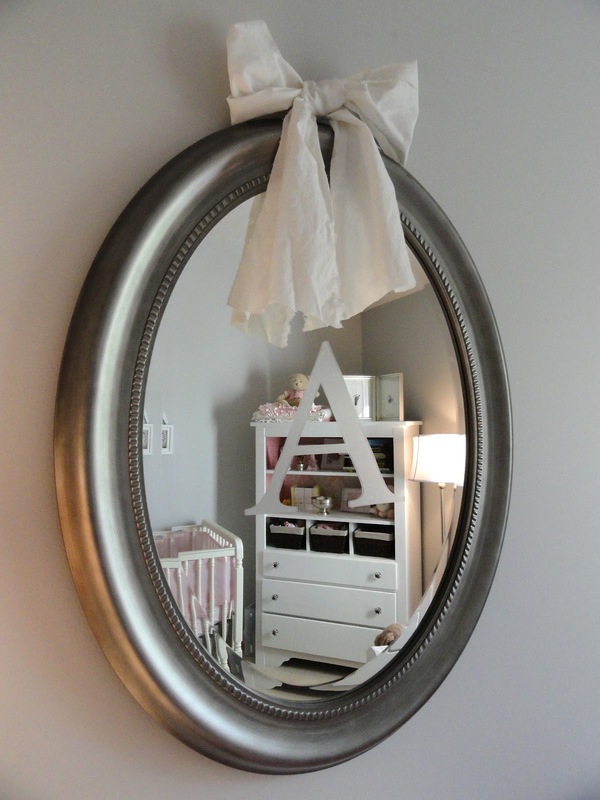 You could really go crazy with fabric and ribbon options! I hope you're all enjoying your Sunday evening! I'm going to NJ for a visit in a few days with Audrey and Lola! I'll try to get a post in here or there, but we'll be very busy visiting family and friends...so if it's quiet here for a few days, you'll know why! First, if you missed the previous meals, click for Part 1 and Part 2. Can you tell that we eat a lot of chicken in this house?! In keeping with the theme, this is another chicken meal, and one of my favorites! Label a gallon freezer bag with the recipe name and date. Cook on low 8 hours, cook on high 4 hours. Toss all the ingredients into the bag, seal, and freeze! I just used it for the first time a few days ago, and loved it! 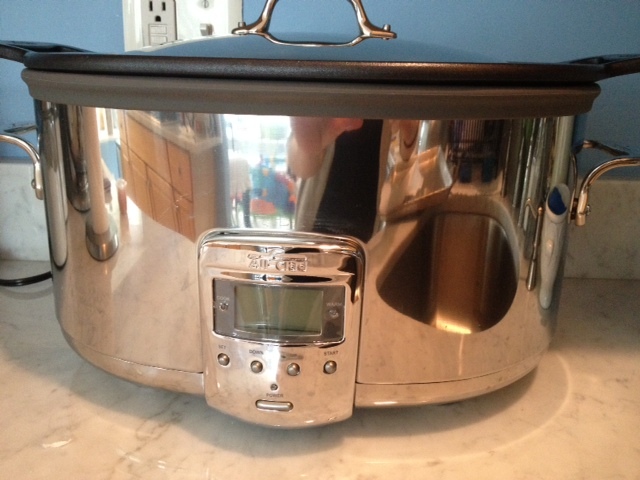 It's so much bigger, and fancier than my other crockpot! The cast aluminum insert can even be removed and set on your stovetop to brown meats before cooking! If you're interested, you can purchase it here. 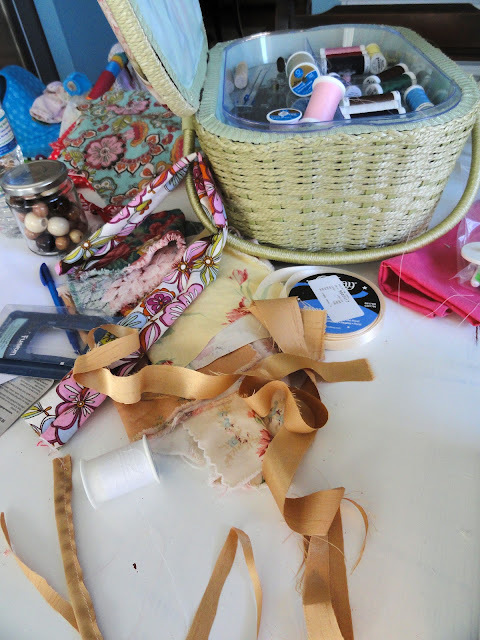 I have lots of fun projects to share with you soon...I just need to find some time to get the posts together for you! 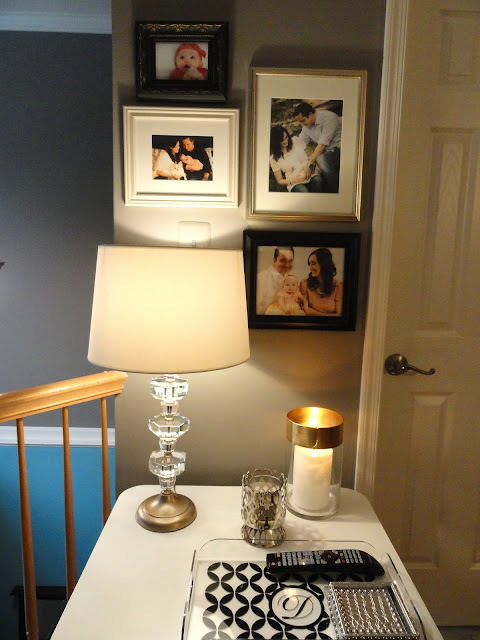 Lately I've had so many ideas for sprucing up the decor around the house. I'm not really sure where it came from all of a sudden, because I feel like I was in a rut for a while. You know when that happens? 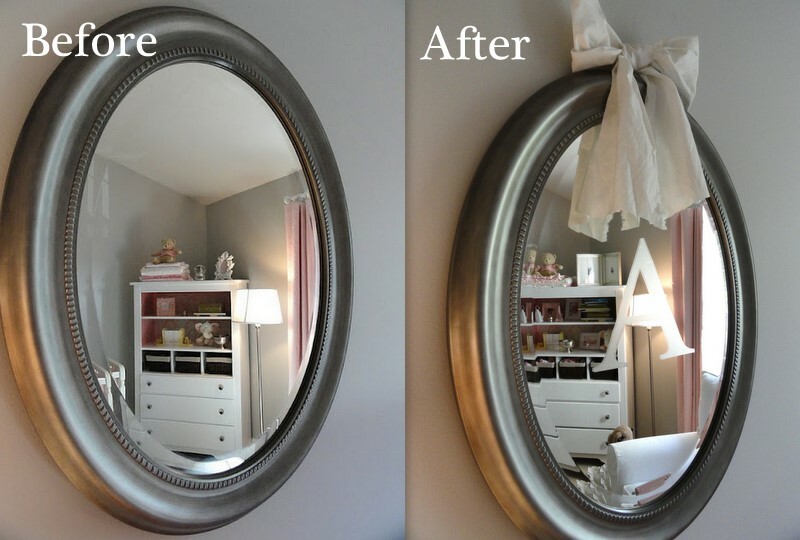 You have a problem area and just can't figure out what to do with it, no matter how much you stare at it?! I've also been really into making things much more personal around here. I think that part definitely comes from having Audrey with us. 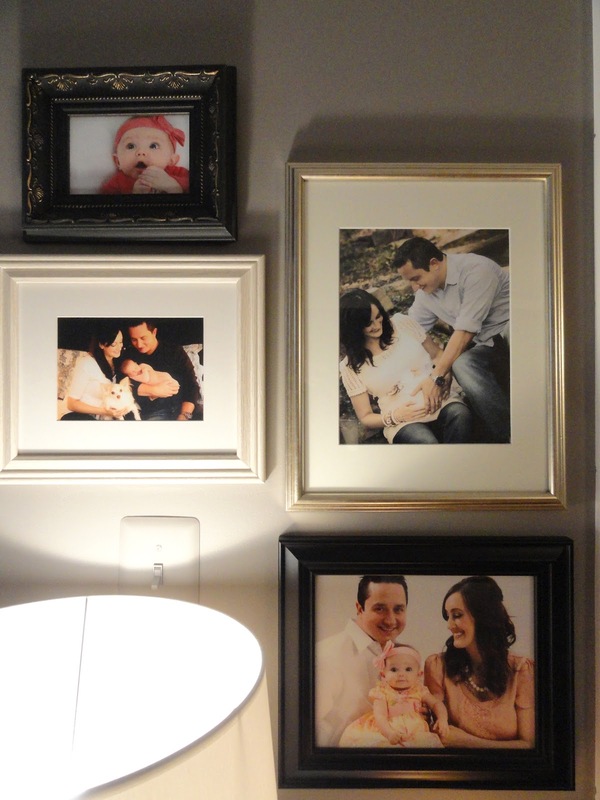 I want our home to reflect us, as a family, more than ever. Remember when I changed my end table lamp a few weeks ago? 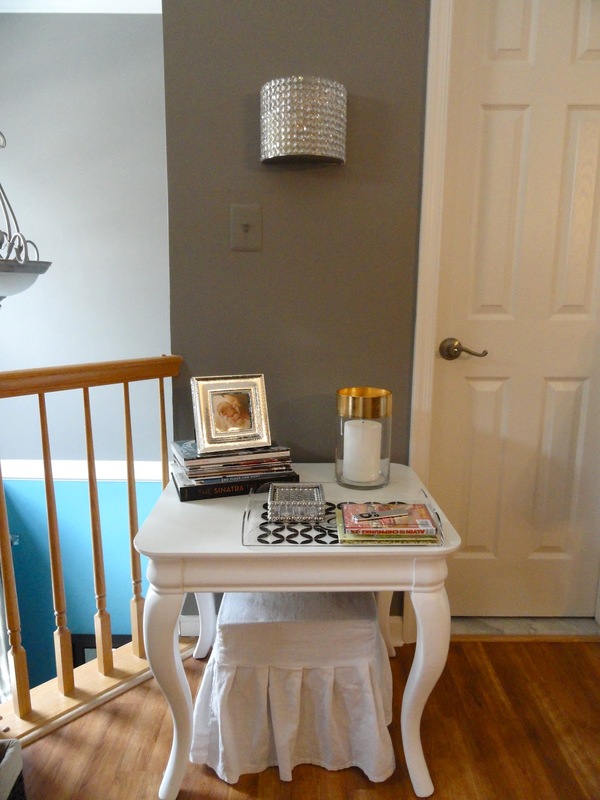 That led to adding a new lamp and decor to the other end table on the opposite side of my living room! I had been in a major decorating rut with this area of the living room for a long time, when finally, inspiration struck. 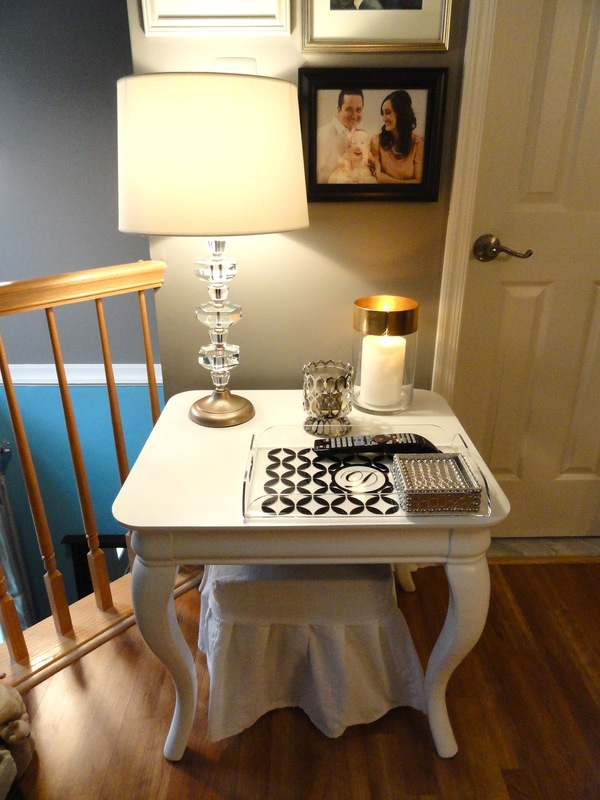 Things just sort of kept landing on this end table. I was just a blah spot where the remotes ended up, and old magazines got stacked. Then, finally, I knew just what it needed....a lamp! 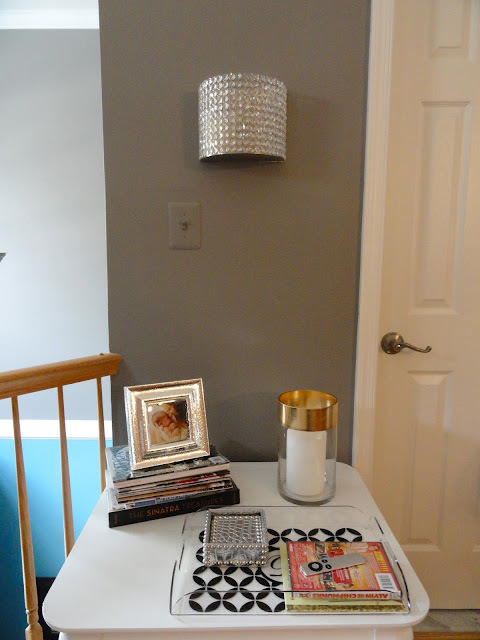 I ended up finding a pretty lamp on clearance at Target for $16! Some of the glass was chipped, but it was on the back side of the lamp base, so you couldn't even tell! It was originally $60, so I was thrilled to pay $16 for it! The shade cost me $15, also from Target. For the wall above the table, I took down the crystal sconce, and added a few frames filled with family pictures. So much better, more personal, and finally finished! Don't you think?! Hi everyone! 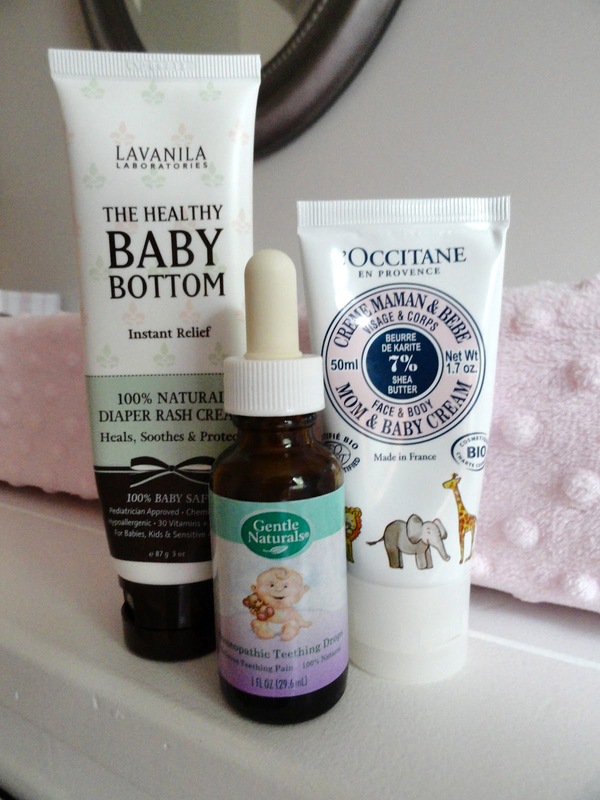 I've been loving these products for Audrey lately and wanted to tell you about them! It's 100% natural, free of sulfates, parabens, phthalates, synthetic fragrance and dyes, and more! I can't believe that my little baby started teething a couple weeks ago! Speaking of baby things, I haven't forgotten to update you on how cloth diapering is going! I just recently started using cloth wipes as well, so I'm just figuring out the best way to use those too. I'll be writing a detailed and informative post on the whole process soon! 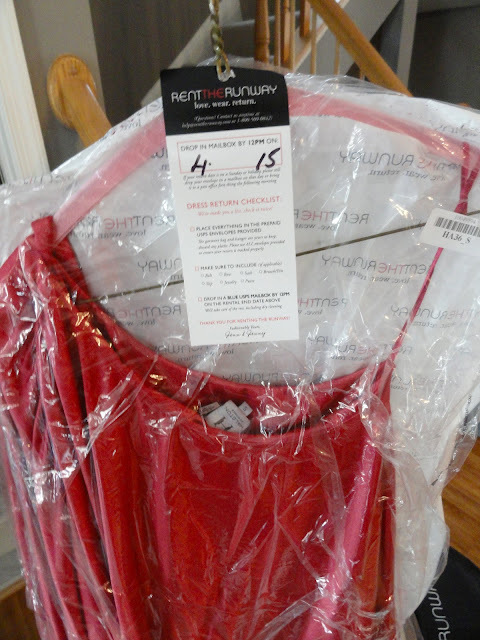 As promised, I wanted to tell you guys about my experience with Rent the Runway. Have you heard of it, or rented from them, yourself? If you missed my outfit pictures of the dress I rented, you can see them here. Rent the Runway's concept is that you rent designer dresses and accessories for a fraction of their retail price, for a couple of days (or longer, if you want to pay more). When I first came across Rent the Runway, I thought, "Why would I waste money renting a dress that I can only wear once?". Then I realized how many formal dresses are sitting in my closet that I have only worn once, and paid much more than what it would cost to rent a designer dress from Rent the Runway. I was sold! It would be perfect for my friend Rebekah's bachelorette party, and it was super affordable since I got a $20 credit when I signed up! Unfortunately, I didn't end up wearing this dress (as you might have realized). I booked the rental months ago in a size 4 and 6 (as a back up), then as I continued to lose baby weight, I realized I would need a 0. Of course, by the time I called back to switch the sizes, they were already rented out for the weekend that I needed them. I loved this dress, and had so much fun wearing it! My only complaint is that it was too long on me. If you click the link above, you'll see that the hemline is well above the model's knee. On me, it was clearly hitting my knee caps. I guess that's what happens when you're 5'3" and have short legs! I ended up paying about $30 for the dress I rented. The rental fee was $50, but I had a $20 credit, so I think that was a great deal! My overall experience was good and I will definitely do it again, for the right occasion. I already got a $25 credit just for filling out a survey! Your dress arrives dry-cleaned and pressed, tucked away in a garment bag. You'll get a pre-paid envelope to return your dress in. You'll even get a simple instruction card with the date you are to return the dress, plus a checklist to make sure you don't forget anything! You get to wear a designer dress! 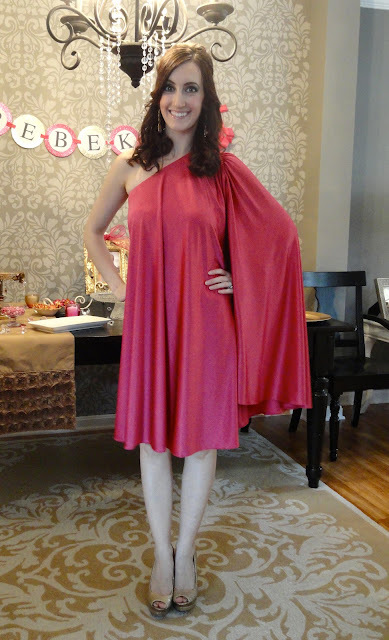 You're not adding formal or party dresses to your closet that you'll likely never wear again! 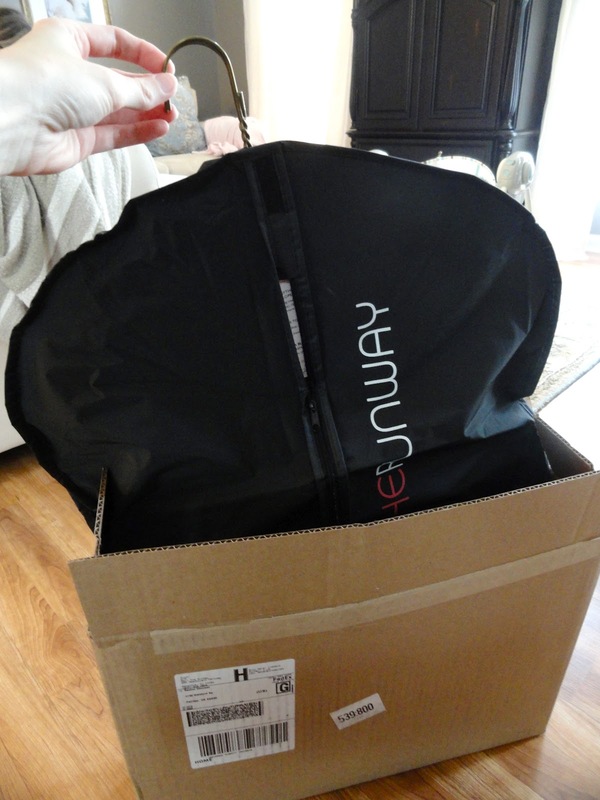 So that was my first experience with Rent the Runway! Do you think you'd consider renting a dress from them in the future? Or maybe you already have?! Let me know in the comments! If you want, you can use my invitation link! 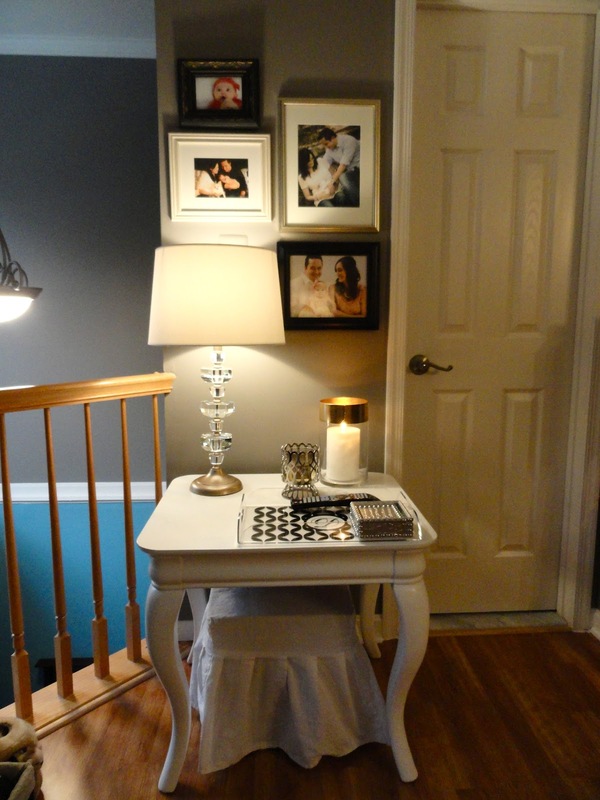 This little project was inspired by a display I saw in Pottery Barn Kids a few weeks ago. I thought it would be a great way to personalize the oval mirror over Audrey's dresser and changing table. It's so easy and completely customizable! 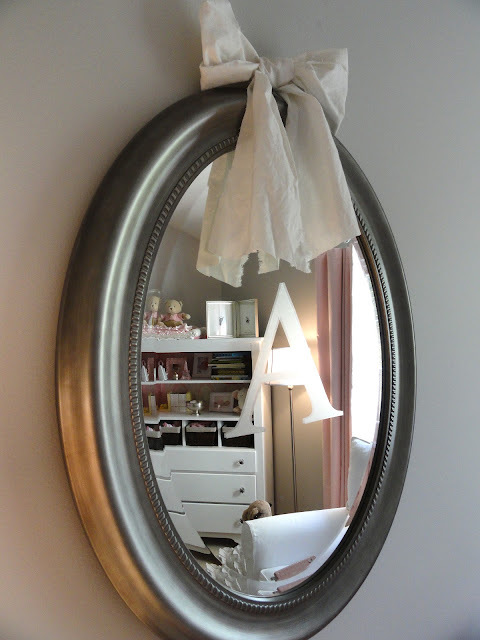 The Pottery Barn Kids display had a burlap ribbon above the mirror, but I used some white fabric to match the rest of Audrey's decor. I just cut out a wide strip and left the edges raw. I think the result is just adorable and it kind of makes me want to put more initials or monograms on other mirrors around the house! 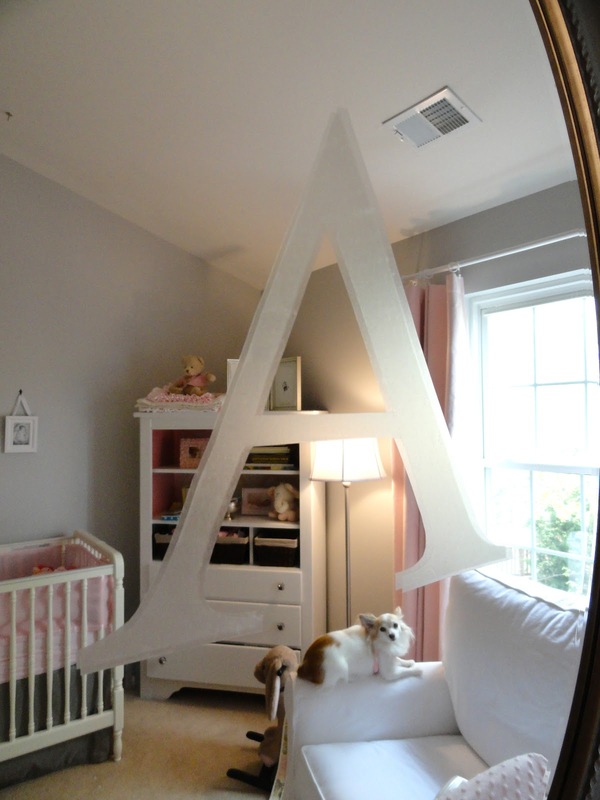 The best part about this is, if I ever want to use this mirror in a different room, I can easily just peel off the letter, and the mirror is back in it's original state! I hope you like this project! Have a great weekend!